I have made a few changes to my Living Room in the last few months and one of them being my new Ikea Rug. It has change the feeling in my living room. It is a large area rug and the price was right, only $99. I have been loving the touches of black and white that I have put in almost every room . A few other things that have been added to the living room is the coffee table, it was blue when I bought it from Urban Outfitters. It was also on sale. I did not love the table when it was blue, but since I sprayed painted it gold, it changed it for me. I love it now! I got a few pillows from Costco and the bird pillows I made. The polka dot pillow was from Anthropolgie. I love that with a few easy changes it has transformed my living room. Here is a view of my living room from my front door. Next week I will post more details about the fireplace and my new tv buffet and the updates I made to the gallery wall behind my mint desk. What do you think about the changes I have made so far? I would love to hear your input. Update: You can see the rest of the room here. Absolutely gorgeous!!! Love the color combination! 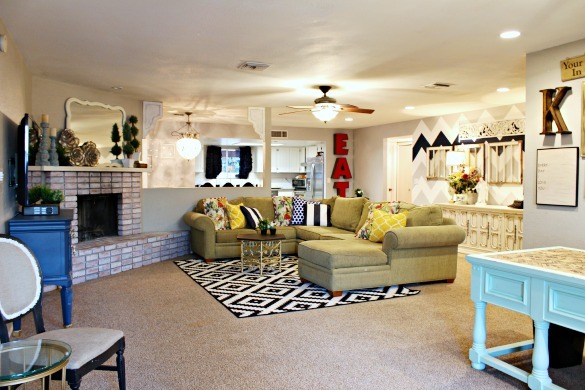 Your living room is absolutely stunning! I really love the rug that you chose! I love it! Did you move your China cabinet, is it still blue ? I love the “eat” letters, can you share where you found them? I love it! I wish my living room looked that good. So fun–I love the mixture of so many patterns! I seriously am in LOVE with this room! It is AMAZING! Ok you are KILLING me right now with all of this perfection! I am in love! Thanks for linking up to the Be. You. Tiful link party! Great rug from Ikea! I love adding black and white into spaces, such a timeless, elegant touch. 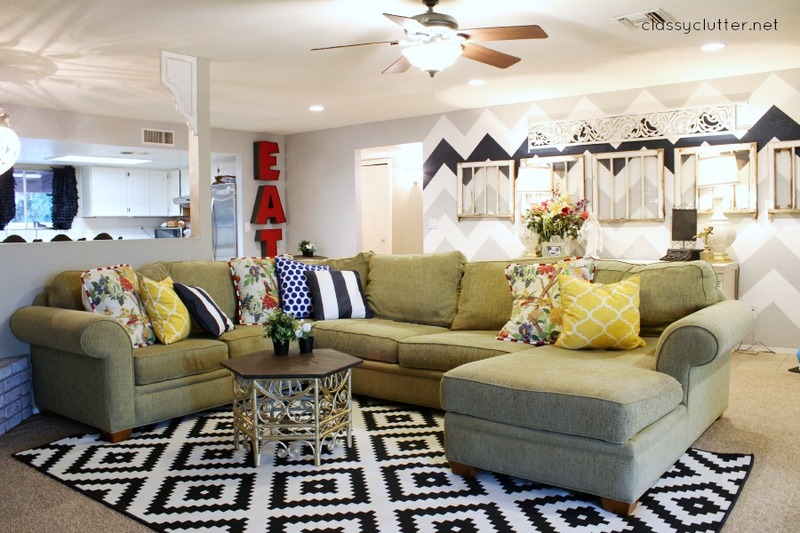 Love that chevron wall! Wow- looks amazing. Great mix of color and pattern. Can’t wait to see the details on the gallery wall behind the desk as well. The giant EAT is great! love it! 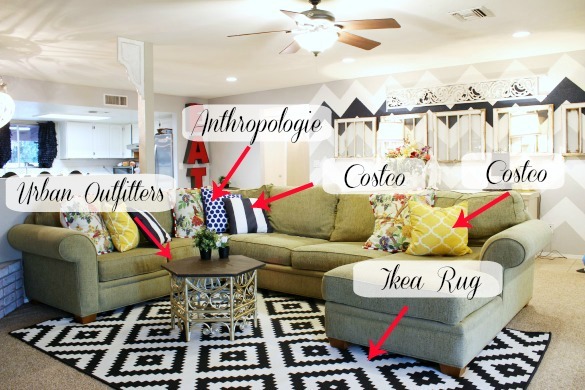 where did you get your sectional sofa? Did you ever find out where this sofa is from?!? I want it!!! I love this room! SO adorable and fun! The rug is such a great find too. always love the bold pattern in that rug. they have pillows of the same pattern, and they’re always on my list. I love it! Mostly because it reminds me of my living room. You must have exceedingly good taste! 😉 I also have a large beige sectional and have been making updates with pillows/rug/acessories in a primary color scheme, with bright red, navy and slate blue, yellow and a leafy green, along with graphic black and white elements. So bright and fun!! Curious as to why the sectional is so large. Would a sofa and 2 chairs work better here? It’s from Ashley Furniture! Thanks! !